You have your first images on your hard disk? OK - to give us plenty of work to do I have chosen a real and "imperfect" set of images. They were taken handheld and do not meet the nodal point! Fisheye lenses tend to have very recognizable light falloff on the outer parts of the image. Also chromatic aberrations are a big issue. You may want to minimize these flaws before stitching your panorama. More technical background about chromatic aberration can be found at the homepages of Jim Watters and Erik Krause. The images show the recently renovated "Kloster- und Wallfahrtskirche der Unbeschuhten Karmeliten" in Vienna. The first 4 images are taken in portrait mode. The 5th image is the so called zenith- or sky-image. I did not shoot a nadir- (or floor-)image because of the regular texture of the floor. To capture the high dynamic range of the interior i have slightly under-exposed. 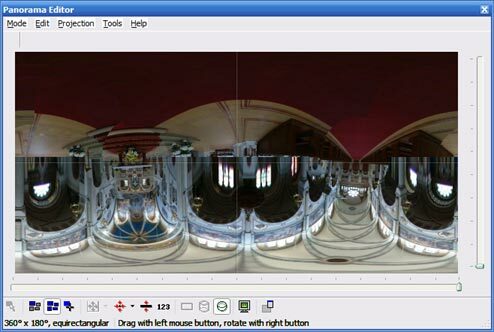 To get the correct exposure, we have to adapt the brightness of the finished panorama. For further processing the images, we need to rotate them to portrait mode. 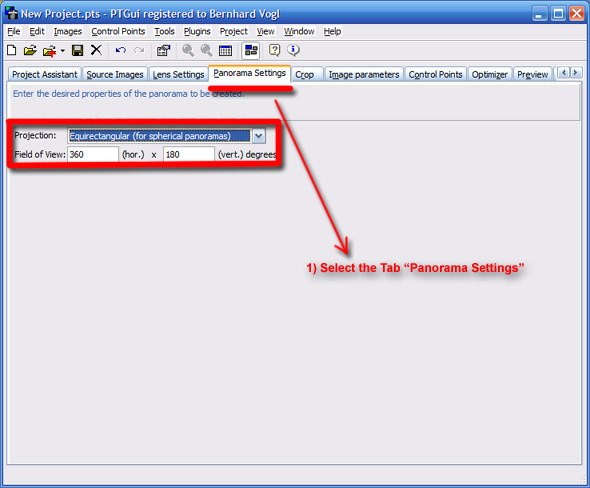 A simple method is to use the "PTGui Project Assistant" on the first tab. 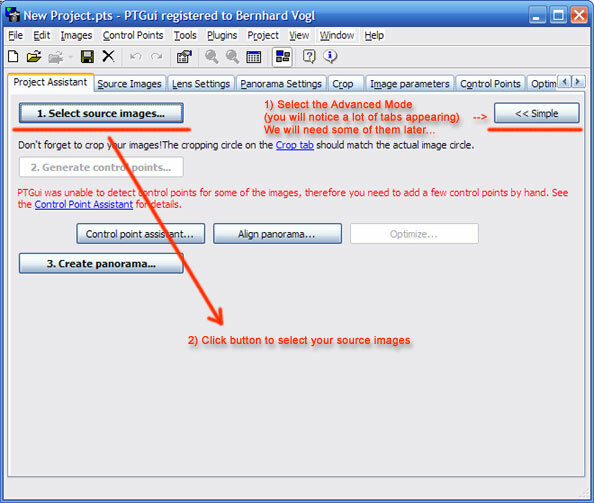 If you get a popup window when loading the source images, telling you about EXIF-data in the JPEG-images, you can savely omit this dialog by pressing [Cancel]. This is, because PTGui can't automatically detect Fisheye images. 8mm Fisheye (e.g.. Sigma): Lens type: Circular, H-FOV: 160°. - This is the horizontal FOV, therefore it is only 160° on a typical DSLR. Full frame cameras or Film Cameras will use the full 180 degrees. 10.5mm Nikkor DX Fisheye: Lens type: Fullframe, H-FOV: 130°. 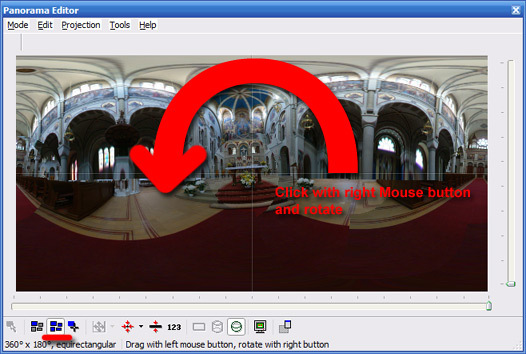 The correct re-calculation of the source images will take place when releasing the mouse button. Also, Don't worry about the black edges of your source images. You can remove them by clicking on the "Crop"-tab. 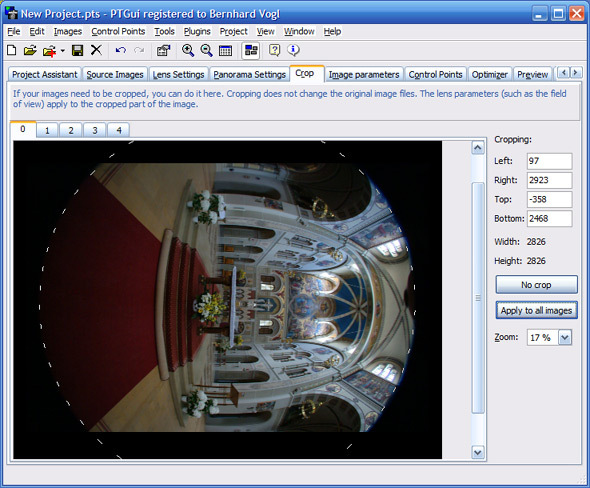 Cropping the image is helpful for visualizing the panorama in the editor window and a smoother overlap between the images. With a click on the button "Apply to all images" we will transfer the crop to the rest of the images. If you look closely you will notice that PTGui automatically adapts the field of view of your lens. This is OK - we use a guessed value which normally would be about 170-180 degrees of a 8mm fisheye on a DSLR.